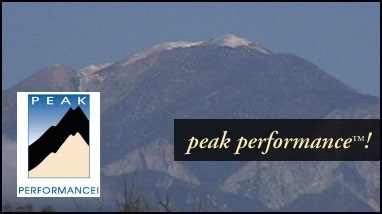 Established in 1994, and re-organized in 1997 by Mark Rowland and John Ryan, Peak Performance!™ serves thousands of clients annually throughout the world. Burt is a Certified Professional Counselor. He has been in private practice, leading seminars and giving keynote talks for over twenty-five years. He is a published writer and poet. In addition, he created and directed the award-winning TV news segment, “Successful Living." He is an avid mountain climber, skier, and outdoorsman. Burt also manages Peak Performance! 's office in Flagstaff, AZ. Defining Moment: Bruce’s outdoor pursuits, quest for adventure, and community involvement have strong and deep roots. In Bruce’s own words, he explains his introduction to the outdoors, “Some of my earliest memories are of camping trips with my family--my parents made it a point to get us out camping at least once a month. Looking back, this was some of the best times I spent with my parents and family.” Now that Bruce has kids of his own, Sarah and Kahle, he and his wife, Ann, make it a point to get them out as often as possible. "Things I really believe in: Honesty, Integrity, Loyalty, living by the "Golden Rule" - Do untoothers... Ascorny as that sounds, I truly believe in that. I try my best to teach by example in the way I live and act. I have always enjoyed working with and helping others, even way back when I was a kid in Sunday school!"